Temple De Hirsch Sinai, in partnership with First AME Church, is proud to present Sabbath of Dreams Weekend. 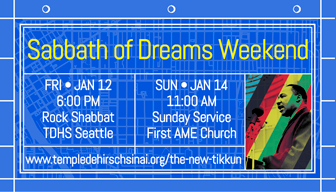 This is Part 2 of the Sabbath of Dreams weekend: Sunday Service with Rabbi Daniel Weiner and Temple musicians at First AME Church, 1522 14th Ave. Seattle, on Sunday, January 14 at 11 a.m.
All are invited to celebrate Dr. King’s legacy and the vitality of the faith community to offer a potent, alternative vision to the polarization and intolerance that continues to plague our country. Open to the public; no RSVP required.